So November is my birth month, and on the 11th of November I turned 28! Wow… I’m already well on my way to join the 30’s club. Today my post is about my travel to the Andalusian region: Cordoba, Marbella and Málaga. My journey started on a Thursday morning (10th of November), and of course my boyfriend was my travel buddy. We drove about 4 hours from Madrid to Cordoba, we’re used to road trips… And I’m mostly the passenger! It was my first time exploring this Andalusian city. We arrived just in time to enjoy the sunset. If you’ve read my earlier travel posts, you’d know I’m a sucker for sunsets and sunrises! That Thursday afternoon we just explored the city on foot, crossing the Roman Bridge, walking around the Cathedral-Mosque. We stayed at the Eurostars Conquistador; our hotel room was next door overlooking this monument! There’re different cultural influences within this city, such as Roman remains, Moorish architecture, a Jewish Synagogue and the predominantly Catholic buildings and churches. I knew that one day wouldn’t be enough to explore the whole city. View of the Roman Bridge and the Cathedral-Mosque. Checking out the monument. The building on the left is the Roman Catholic Diocese of Cordoba. Another view of the Roman Bridge and the Calahorra Tower (fortified gate). The next day, which was my birthday, I woke up bright and early to explore the city by myself. 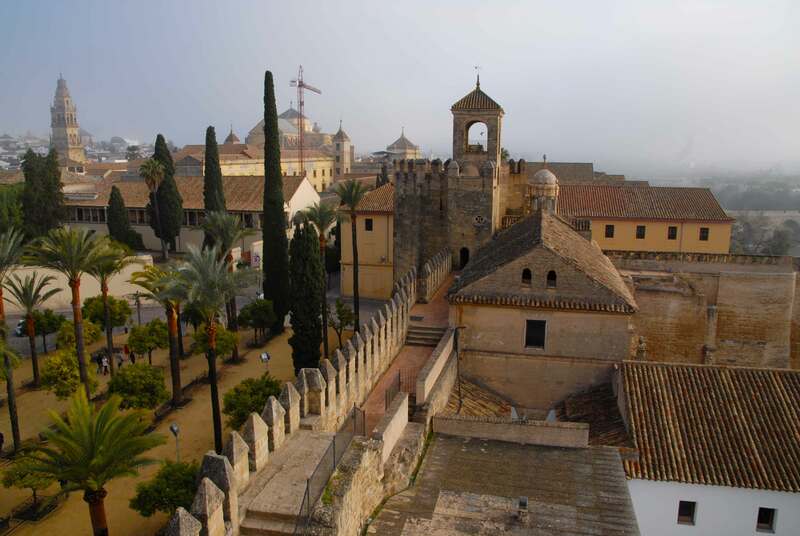 The first place on my list was the Alcázar de los Reyes Cristianos (Alcazar of the Christian Kings). It has beautiful gardens, Moorish baths, towers, stables, impressive Roman mosaics and also well-kept inscriptions on the walls. As I was walking towards this monument, it was misty and a bit chilly. The entrance was free of charge (usually costs 4,50 Eur) and the best part was that it was not very crowded. Here you can see the Cathedral-Mosque in the far back and the tower in the middle is the Tower of Homage or Keep at the Alcázar de los Reyes Cristianos. After exploring, I headed back to the hotel to meet my boyfriend and we went to the Cathedral-Mosque. The ancient Mosque of Cordoba was impeccably well-preserved (with some renovations here and there), but in general everything was protected or has been restored. The white and red arches were my favourite part, it really gave me a sensation of being in a mosque. Although you will see more Catholic influences or adaptations that were built over time. The ambience was very international; visitors from all corners of the world were walking and trying to take pictures of this sanctuary. Furthermore, when we arrived a choir of kids were singing gospel songs that resonated throughout the halls. It was a marvellous sensation to have visited this World Heritage Site! Next on my birthday travel-wishlist… I wanted to hike in a national park at the gorge Disfiladero de los Gaitanes. But this trail was like no other! 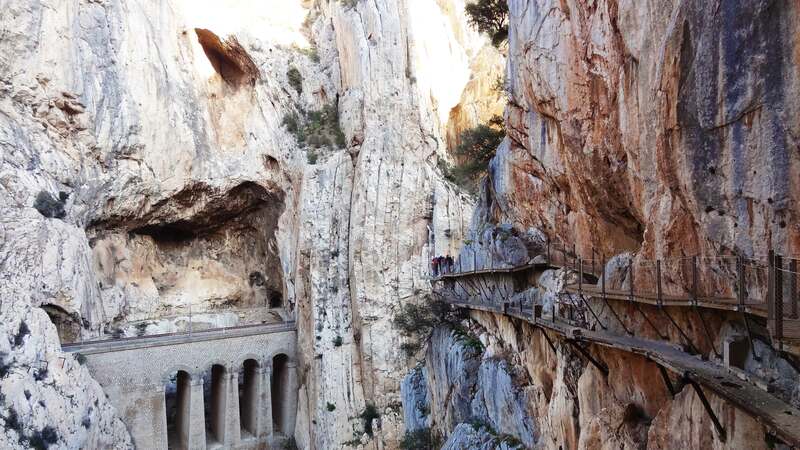 El Caminito del Rey (King’s pathway) has been named like this because King Alfonso XIII inaugurated the Chorro Dam and walked along the pathway in 1921, known before as the Camino de los Balconcillos (the gorge had balconies in the upper part). Since then the villagers referred to the pathway as El Caminito del Rey. The remarkable Caminito del Rey, on the right side you can see the old pathway (below, closed in 2000 for security reasons) and the new pathway (re-opened in 2015). We booked our tickets in advance (a week or so), which included a bus trip at the end of the pathway because the route is not circular. After our visit to Cordoba we drove to this area (“entrada norte” or the northern entrance). It took us less than 2 hours to arrive to the starting point. It was really tricky to find… because you had to enter a tiny tunnel. After going through the spooky dark tunnel, we walked about 1,5 kilometres before we reached the area where they checked our tickets. After we received our safety helmets, the park ranger gave us an introduction and told us the prohibitions. The hike was about 6 kilometres and we crossed wooden walkways that were extended 100 meters above the air and next to the gorge. We took about 2 hours to do the entire walk, because we stopped way too many times for photos. This trip was well-worth it and had breathtaking views! Way up in the air! At the final part of the pathway. In order to make my birthday extra special I wanted to stay in a castle! So after walking the Caminito del Rey pathway we drove about 50 minutes to Monda, specifically to a Moorish castle called El Castillo de Monda (the Castle of Monda) and also known as “el fortaleza de al-Mundat” (a Moorish fort). This castle sits upon a hill called El cerro de la Villeta and it was quite hard to reach by car, because of the narrow streets. Nevertheless, once you reach it you will be amazed by its modern Andalusian designs and gorgeous views. The restaurant has the best views and the hotel even has a pool area. This place has been reconstructed over time; still part of its old tower and walls remain. Even a love story and battles of the Spanish inquisition! If you’re superstitious I bet you will even be spooked at night! I also loved the details in our room and we even had a hydro-massage bathtub! All in all, I loved being there because you can get a taste of its history and feel like royalty! After enjoying a wonderful stay in Monda, we drove about 20 minutes to Marbella. Here we stayed a couple of nights at the Gran Meliá Don Pepe, which is a luxurious hotel located near the city centre. We had one of the best rooms (Premium room) overlooking the sea and pool area. It was a relaxing stay as my boyfriend and I got to enjoy the facilities like the gym and indoor pool. We were also able to bask a little bit in the sun on the loungers. The best part for me was the breakfast, which was a buffet with a full-range of fresh produce and even had show cooking. Striking a pose near the pool area of the Gran Meliá Don Pepe. On our last day we got a one-of-a-kind tour to the penthouse suite of MÖET & CHANDON and a junior suite. The penthouse suite was amazingly elegant with its white, gold and black designs. Knowing that celebrities like Naomi Watts and Eva Longoria stayed there was icing on the cake! We saved Málaga for last. This city has always attracted me because it has so much flavour and you can explore it easily on foot. We strolled the city centre and especially visited the Castle of Gibralfaro, which has a 360-degree view of the city. Checking out the port area from the Castle of Gibralfaro. We also visited the port area. Since there were constructions being carried out on the metro system (driving there was dreadful); we decided to stay at a town nearby called Torremolinos. We also drove to the Puerto de Marina to see some of the fancy yachts and enjoy the sunny weather before heading back to Madrid. Birthdays for me have always been about celebrations ever since I was growing up. What 27 has taught me is not too take myself too serious, learn to let go, love myself unconditionally and especially cherish close relationships. I’m certain that 28 is going to be much more fun and full of life lessons as well! As you could have seen in my post I celebrated a week-long like a queen. I’ve also got to travel to many places on my bucket list such as the Mosque-Cathedral of Cordoba and the Caminito del Rey pathway. Life is too short, to live small dreams! I hope you liked my post and that it has inspired you to visit these wonderful places.